"MY mother’s meatloaf was correct — moist, well seasoned, part oatmeal, mostly beef, with a band of bottled red chili sauce down the center. It was dependable, but it was not the stuff of dreams. Other mothers’ meatloaf recipes sometimes appeared, like a stuffed, cheesy one I liked, but mostly the house version prevailed throughout my childhood. To my emerging sensibilities, the occasional stuffed cabbage was more interesting, and chafing-dish Swedish meatballs had a certain appeal. I also liked the smell of hamburgers before they were cooked, sprinkled with salt and pepper and resting on wax paper. "The Middle Eastern way with ground lamb, or beef, for that matter, is in combination with cracked bulgur wheat and onion. There are hundreds of ways to turn this delicious mixture into kibbe, little football-shaped savory treats sold and eaten everywhere and made daily in homes throughout the region. (There are other kinds of kibbe, too, like fish, but that’s another story.) For a less labor-intensive version, kibbe can also be baked like a flat cake. It makes an extraordinarily fragrant meatloaf, adorned with long-cooked caramelized onions and pine nuts, to be eaten hot, warm, cold or reheated. 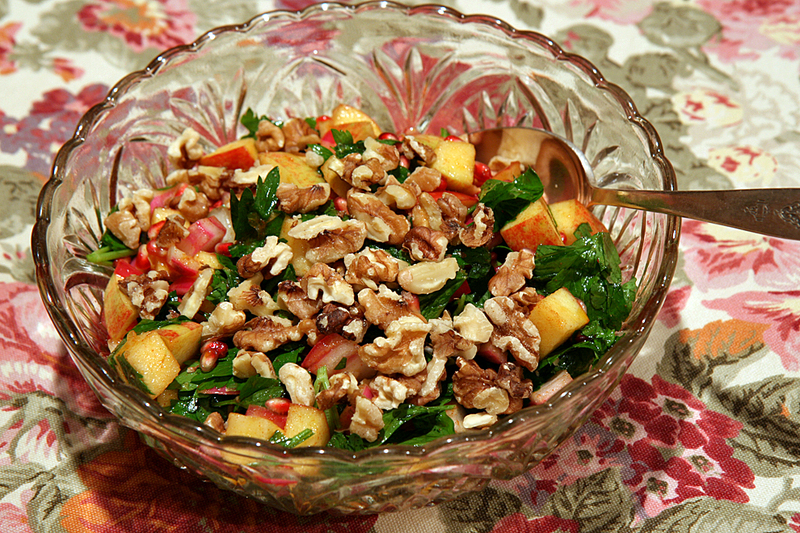 "This recipe comes from the Lebanese grandmother of a good friend. 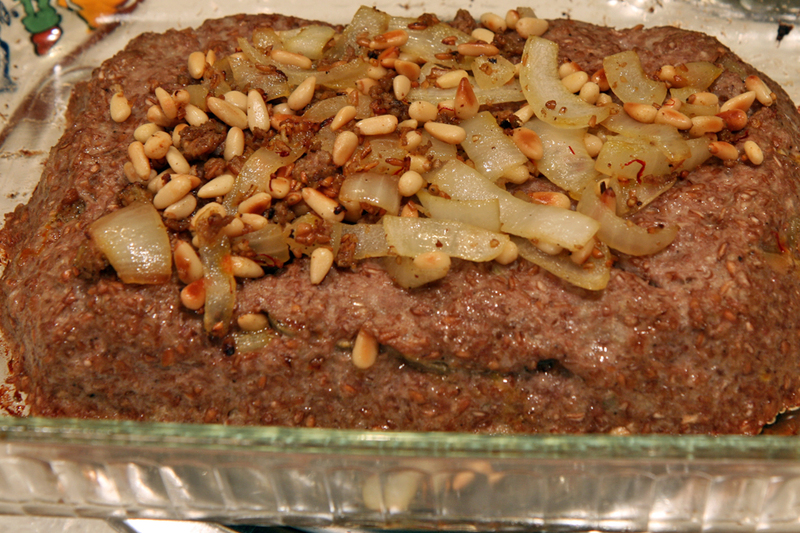 It’s a basic baked kibbe that depends only on onion and cumin for its satisfying flavor. The granddaughter says that her people are from a mountainous area of Lebanon where not many spices are used. Other cooks might add cinnamon, allspice or clove to the meat, or a pinch of saffron to the onion. "The preferred accompaniment is good, thick plain yogurt, but the dish is very good, too, with a salad of tomato and cucumber, bathed in a dressing of garlic, herbs and yogurt." Meatloaf is one of my favorite foods and reason to make on a retirement budget. Can't wait to try this one. You have the best food. Thanks for sharing. Richard from My Old Historic House. 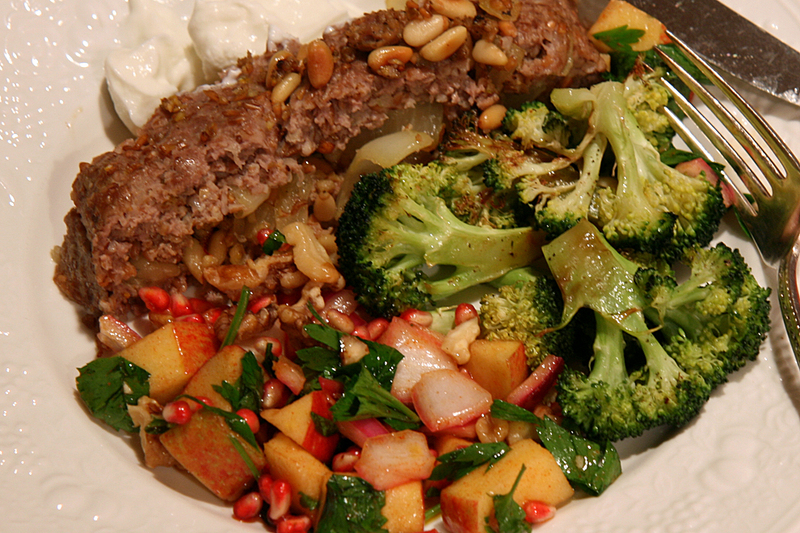 I made this not-exactly-meatloaf recipe recently too - I agree, definitely a keeper! And the tabbouleh looks great!